Brennan is a creator of collaborative plays, devised performances, and physical theatre. His work is to challenge the audience with the present and to remind them that the world is a playground, where possibility is currency and moments can sustain us. He doesn’t create in any one given way. Each project’s creation process is different. His work is a blend of writing, improvisation, Viewpoints, butoh, long walks on the beach, and ol’ fashioned mayhem. A two-hander originally written for The Anywhere Theatre Festival in Brisbane, Australia. 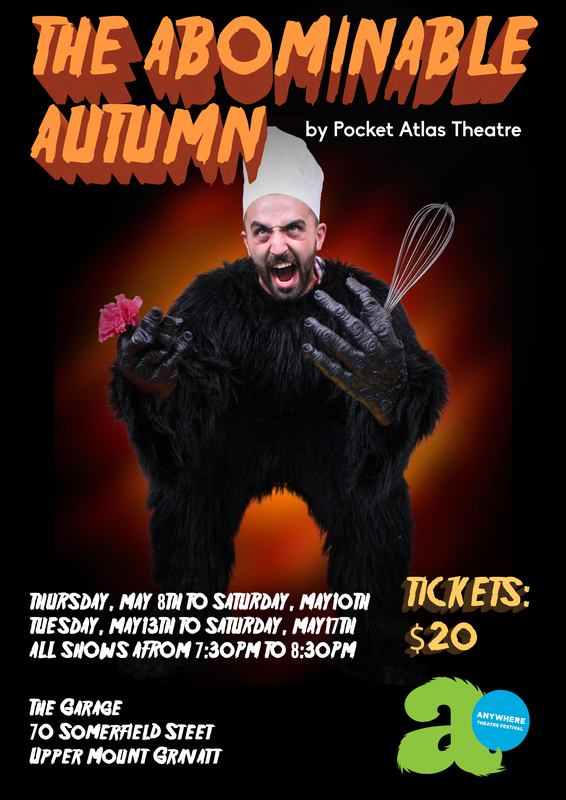 The Abominable Autumn is a dark comedy which follows the rise and fall of a celebrity chef, a very hungry gay couple, and an ancient secret from the Canadian wilderness. The audience witnesses two narratives set on crash course with each other, culminating in a horrifying climax under the lugubrious moon. Uproariously funny, this show currently has plans to be imported to Canada for a Fringe Tour in the near future. 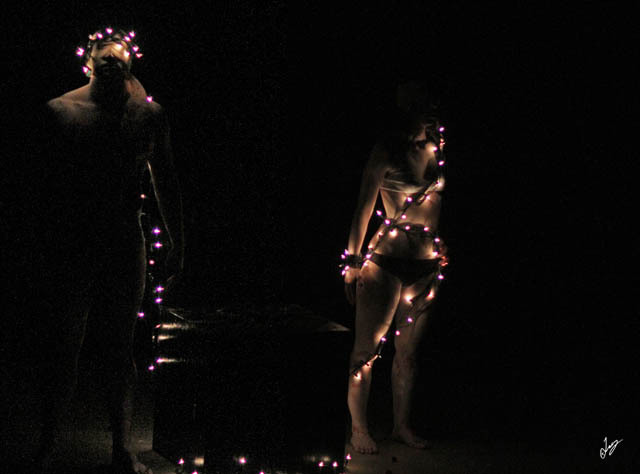 Breathing Room is a duet, co-created by Brennan Campbell and Nicole Shafenecker, exploring isolation and connection within relationships. A romance leads to an unforgiving precipice. The moment where one’s projection of a person and the truth of a person meet. The couple finds themselves in free fall. What lies at the bottom? The edge of a knife, a moment of unison, or another Saturday on the couch? Created through devised process and The Viewpoints, Breathing Room is a visual exploration of the subconscious minds of lovers. First presented as a fifteen-minute experiment into dancing without sight, the piece has been developed through two workshop presentations with Good Woman Dance Collective over the last year. In its current incarnation, the show runs roughly twenty minutes and features live music. Michael Davidson’s one man show about the nature of risk taking. Experimental in nature, the show is part improvisation, part scripted manifesto, and part post modern performance. With a medium is the message approach, the show’s festival description was notoriously “Take a risk.” Brennan’s direction involved creating an environment where anything could happen. The show featured a stage manager actively working on stage with the performer whose job was to cue the tech and to attempt to throw off the performance via re-ordering scenes, creating improvised text, and encouraging heckling from the audience. Local Pizza Boy Kale has hit rock bottom. Freshly dumped and out of a job, his mediocre life has shifted down a notch. Little does he know that his actions will determine the fate of all mankind. 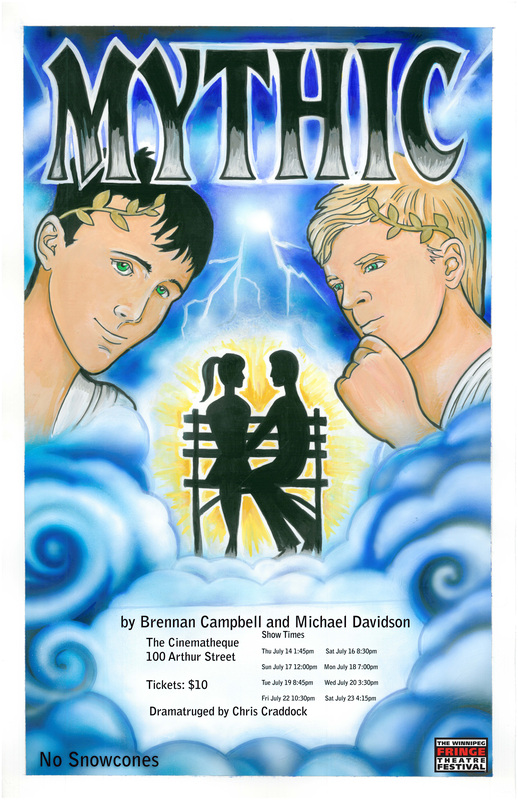 Mythic is the tale of an ordinary man made extraordinary through mythical plot devices, physical theatre, and rhyming narrators. This slapstick comedy deconstructs creation myths and races to save the world in one rapid-fire hour. Originally produced for a three-city Fringe Tour of London, Winnipeg, and Regina. 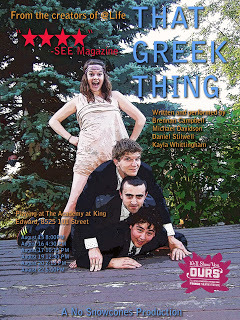 Prepare yourself for a comedic romp through Greek Mythology. Pandora has unwittingly unleashed all of the horrors found within her Box. Humanity is no longer safe as Ancient Greece, pop culture, and 70’s dance music are gloriously ripped apart in order to find and contain the evils. Utilizing ideas found within Keith Johnstone’s Impro, this sketch show promises nothing short of bloody victory. 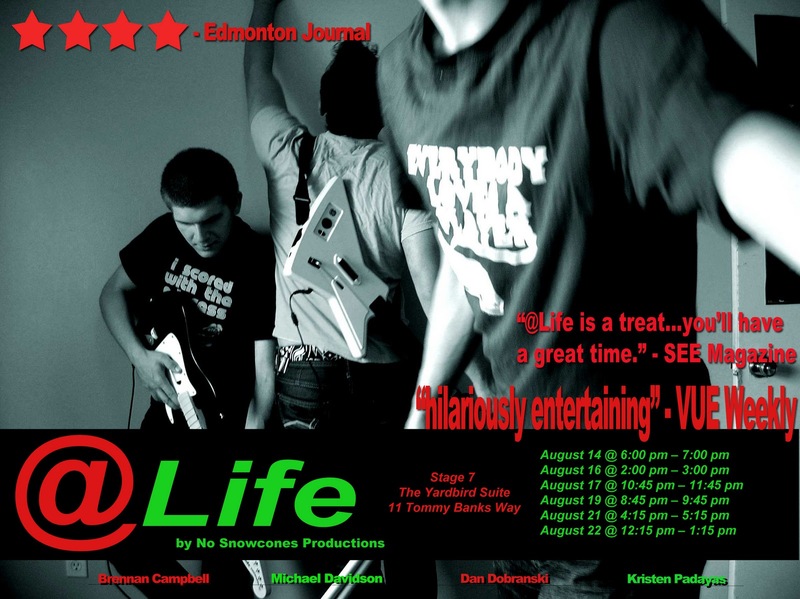 Originally performed at the Edmonton Fringe Festival. and technology, including the pros and cons of video game culture, computer dependence, and the role of the Internet in contemporary society. Written and performed by a team of fresh graduates from the Grant MacEwan Theatre Arts program. Originally performed in NextFest 2009 and the Edmonton, Victoria, and Vancouver Fringes.